This April, Dana Hall will hold its fifth She Sails event where women from across the vast Dana network gather to learn from each other, share their stores, and encourage one another to be bold and dream big. In the coming months, we’ll be highlighting one of our She Sails 2019 panelists in each Alumnae Newsletter. This month, we caught up with Lizz Branson Fabel ’74 to see how she’s sailed far since graduating in 1974. Tell us about your path since graduating from Dana Hall. I worked for Syracuse University after I graduated from there in 1978 for nine years as a graphic designer in the publications department. I moved to Wisconsin in 1987 to join my then-boyfriend (now husband) in his graphic design business that we ran together until 1999, when I became interested in cooking, something I had always enjoyed, but never thought of as a career. I became a personal chef first, when nobody knew what the hell that was, and did that for one year. After not taking a salary for all that time (Wisconsin was a tough sell! ), I ended up working at the Milwaukee Institute of Art and Design as an administrative assistant for a few years, then got a job at an advertising agency in 2001 as the business manager and bookkeeper. Meanwhile, I had started baking bread for fun. Since I never went to culinary school, I attended an intensive three-day continuing education pastry class at The French Pastry School in Chicago in 2004. By the time Facebook rolled around, I was posting photos of my baking online. 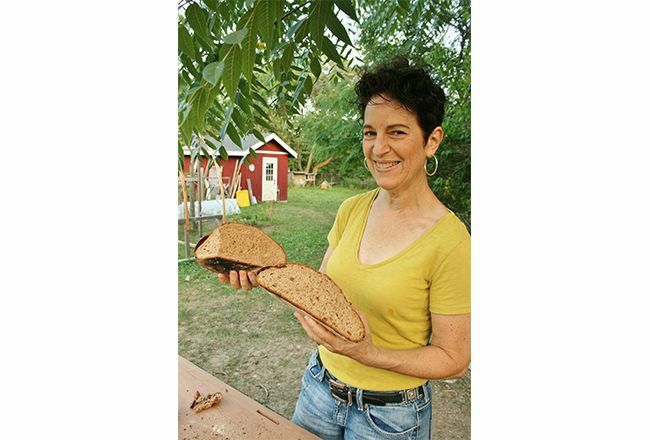 I would bake bread out of my house and drive it all around Racine [Wisconsin], and managed to build up quite a clientele, one of whom was the owner of a meat-packing company, who allowed me to use their commercial kitchen to bake bread on a larger scale. I would bake all day Friday and sell in farmers’ markets on Saturday. God bless the people who owned that company; they never charged me a dime in rent. Now, a winter indoor market has opened up and that’s where we are today: The Bread Lady. It’s fun to bake the bread but even more fun to sell it. I love hawking. You gotta yell at people and make them look at what you have on your table; it’s really quite challenging, and very gratifying, in a lot of ways. What made you say yes to being a She Sails panelist? What are you most looking forward to about the event? I love the opportunity to talk about baking; I really want people to know that. The thing for me, when I was thinking about how I’d love to have my own business, was that I’d come to love the comfort of having a paycheck. But these days there’s no security in that—that can end at any time. If you truly love something and you’re not shy about talking about it, take advantage of your networking and you can do it, especially in this age. There’s so much free advertising available with social media. What was your most memorable Dana teacher or class and why? Art classes with Mr. and Mrs. Scattergood; they were just wonderful. I really enjoyed those classes a lot. They had such insight and got me to observe things so much more closely. My other love is art and design, and that’s what I ended up doing for a living for a while. I always felt like I had to be able to draw more skillfully and they really helped me with that. The February Week program I was also very inspirational. It was a week in February where classes were all on hold, and students could take advantage of different seminars and instruction in all kinds of disciplines from the teachers. They all taught things they were interested in doing. I was very interested in sewing at the time, so I took a lot of sewing classes. What advice would you give to Dana girls or alumnae who are interested in this field? Really communicate with people in the field. Push your way in. Get recipes, talk to people in restaurants, talk to people like me. Dig in and get the details—don’t be shy! If you want to do something like what I do, I’ll sit down and talk to you about it. I’ll share things I would have liked to have known and how to get started. Be a communicator. Be inquisitive. If you meet someone who’s very passionate about what you’d like to do, latch onto them. Pick their brain until they’re sick of you. They should love to talk to you about what they do!